Position rack in upper third of oven; preheat broiler. 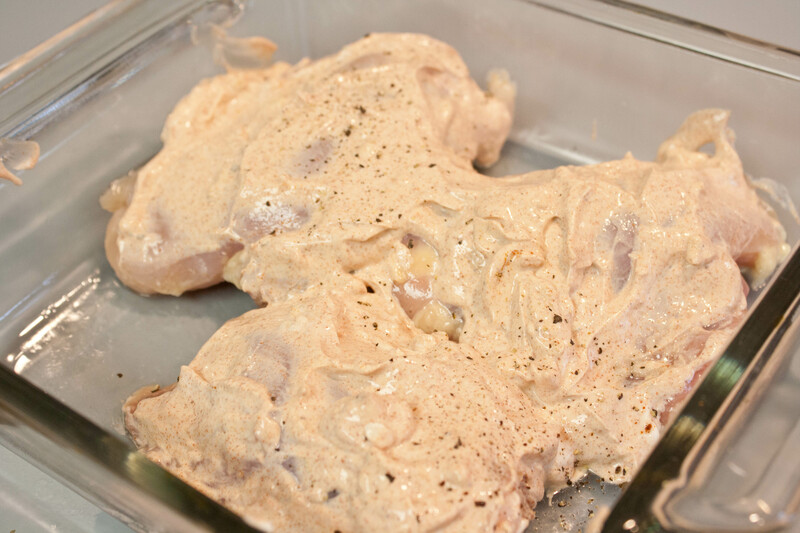 Remove the chicken from the marinade (discard marinade). Place the chicken on a broiler rack and broil until browned on top, about 15 minutes. I’ll be honest: Saturday came and I didn’t really want to make homemade pizza. Saturdays are kind of homemade pizza night but I wanted something different. I had some chicken thighs defrosting in the fridge so I decided to find a new chicken recipe to try. As for the fresh Ginger, I looked online again to see how much to substitute dried ginger and unfortunately, it was not recommended. (Check out this website.) Because of what I read on the website, I didn’t add very much of the dried ginger. I just didn’t want to risk ruining the recipe. The prep was really easy. I was halving the recipe since it was just the two of us. Instead of 8 chicken thighs, we had 3 (2 small ones, 1 large one). We’d have enough for dinner and leftovers. I removed the skin and fat from the chicken thighs. 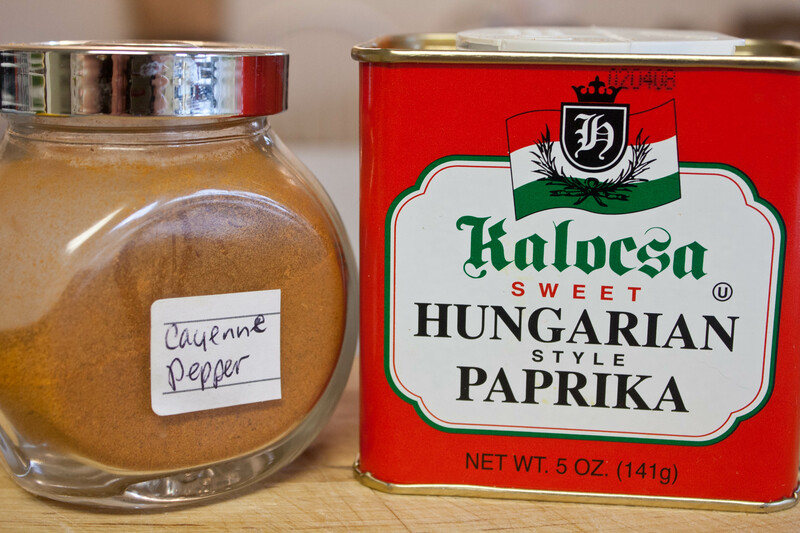 I didn’t have hot paprika so I followed the recipe to create my own “hot paprika” with sweet paprika and cayenne pepper. 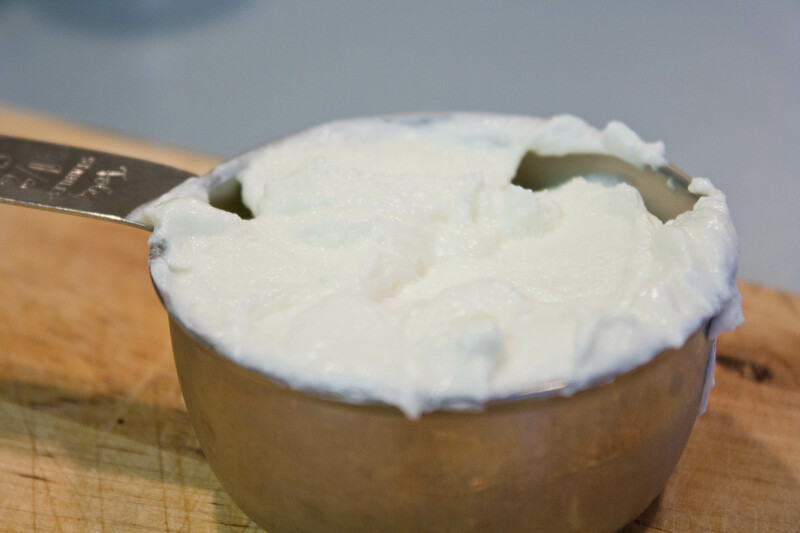 I used plain Greek yogurt and mixed all the ingredients into it and whisked it together. It smelled aromatic and delicious! 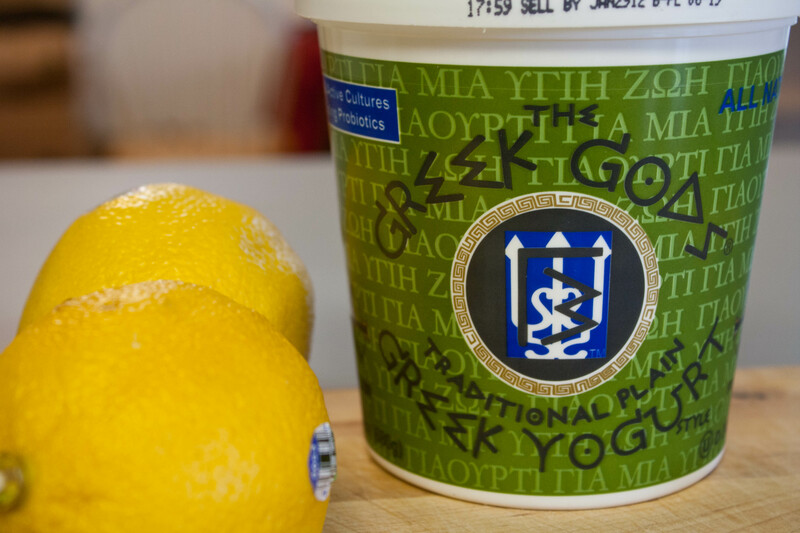 I was excited that the yogurt mixture was so yummy. 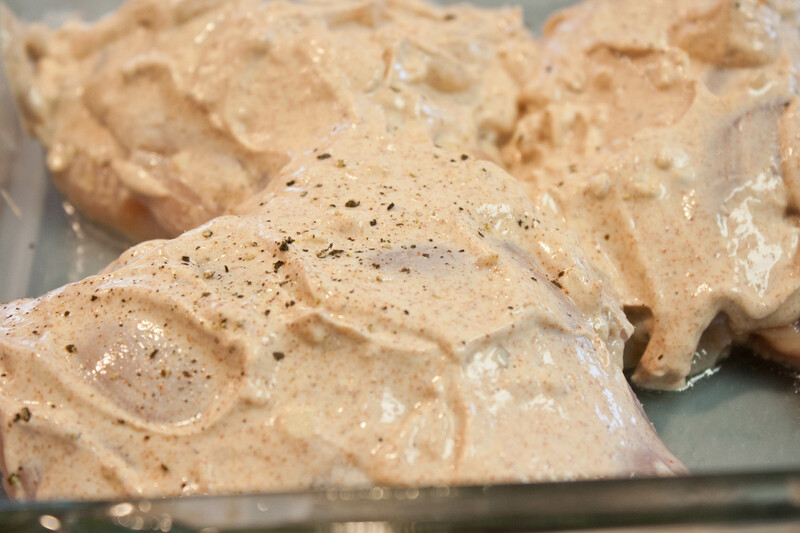 Once the chicken was clean and dried, I poured the freshly squeezed lemon juice on the chicken and then topped it with the spicy yogurt mixture. It went into the fridge to marinade for about 2 hours. Then we got ready to cook! Then came the hard part: the broiler. I am so not skilled in broiling. I’ve thrown more food away that I tried to broil and it failed miserably. I was crossing my fingers that this recipe worked! 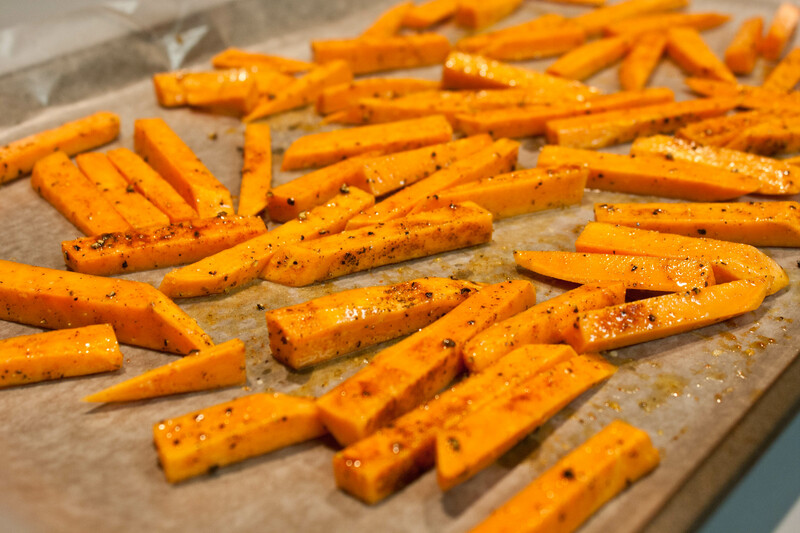 While the chicken was broiling for 15 minutes, Michael peeled and cut some sweet potatoes to make fries. 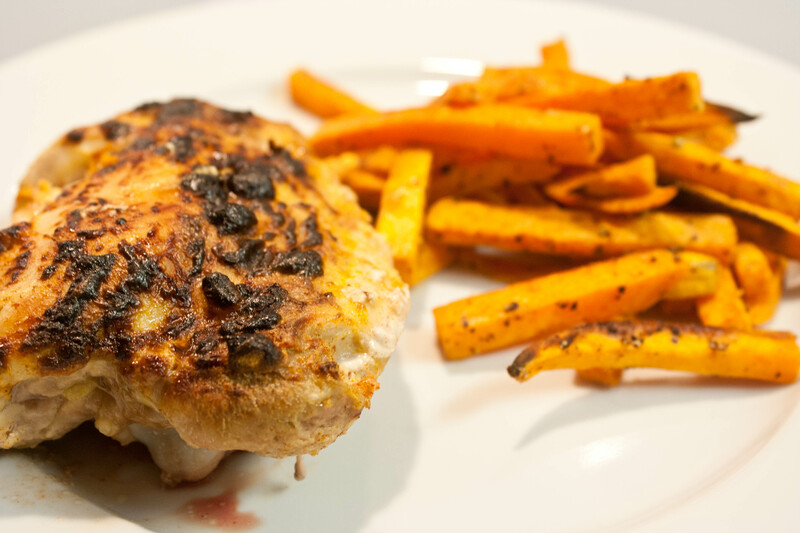 The seasoning used in the sweet potato fries were the same ones I used for the chicken–cayenne and paprika. I figured they were compliment each other nicely. They did end up being really good but the fries were spicier than the chicken, so a little overpowering. The spice wasn’t bad, it just took away some of the flavor that the chicken had. 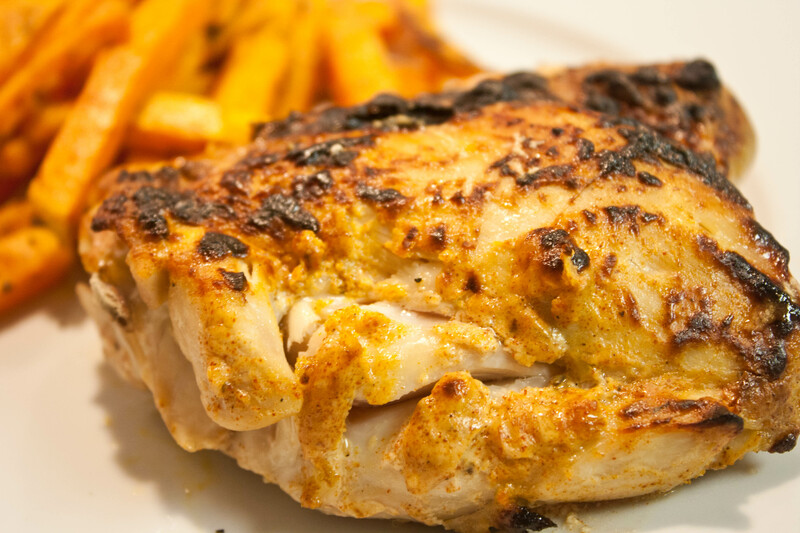 Michael and I agreed that we’d do a different side dish the next time I made this chicken. How did the broiling do? It went well, actually! I checked it obsessively every few minutes, but it seemed to be doing okay so I let it ride. I also baked the fries at the same time as the regular baking of the chicken (not the broiling). The chicken looks a little crispy, but it wasn’t burned. It was moist and flavorful but like I said, not overly spicy. I’m curious how the dinner would taste differently with fresh ginger and some mint. The yogurt sauce had baked off the chicken by the time it was done. I had a glass of a Pinot Grigio to go with the spicy chicken and fries. I’d try the recipe again–next time with a Basmati rice as a side and maybe a cucumber salad. I’d also try and find the fresh mint! 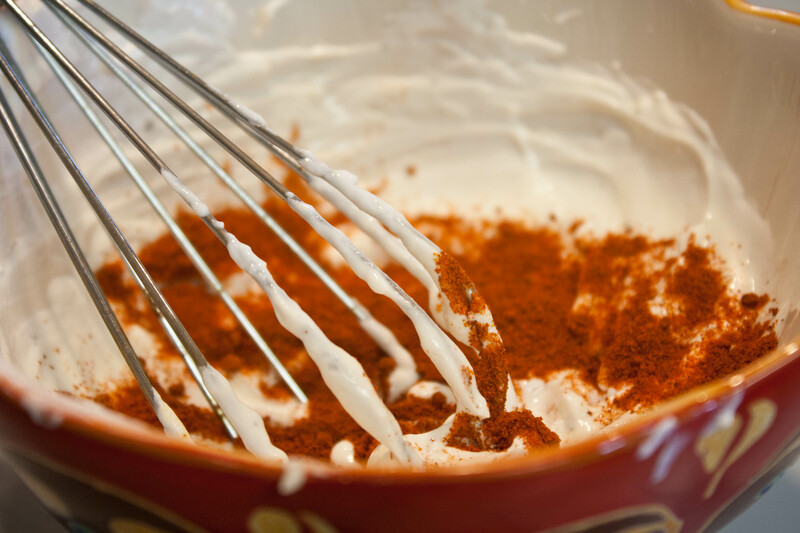 QUESTION: Are you adventurous in your recipe trying? What’s a recipe you want to try but are scared to? Dang it! Why didn’t I think of that? Pinot Grigio is my favorite! 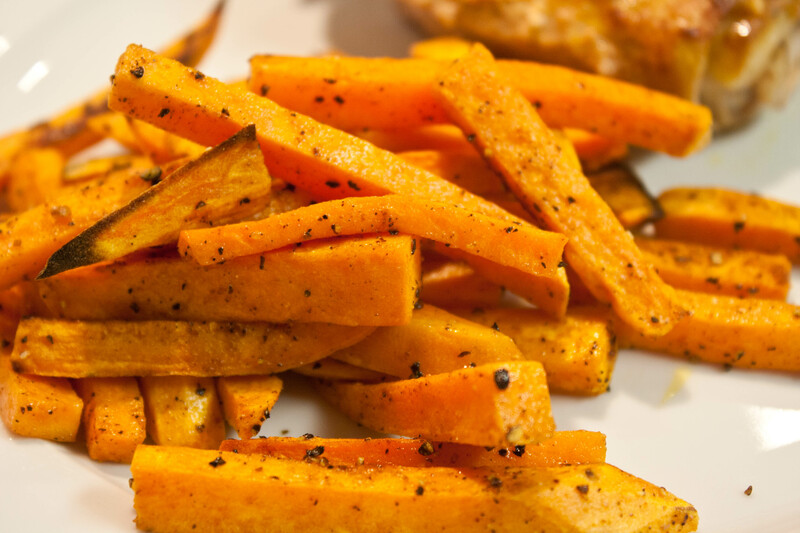 I tend to go simple on fry seasonings because I love the flavor of the sweet potato to shine through. 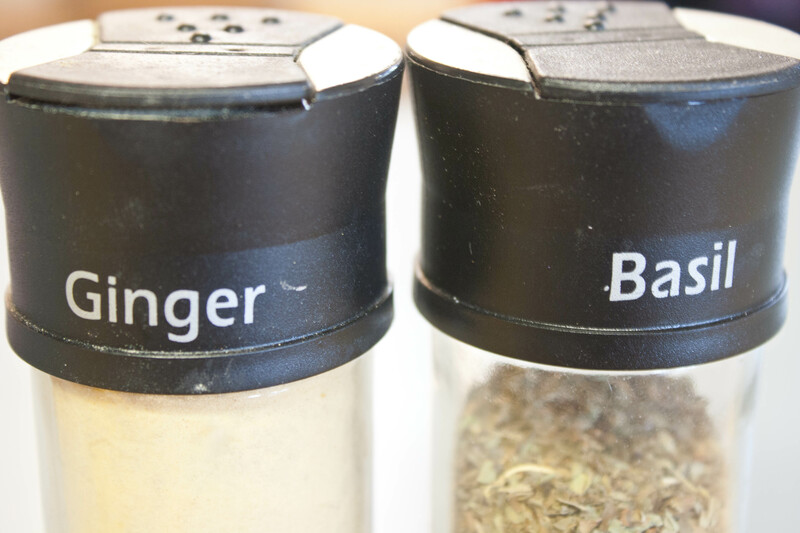 Also, I like using jarred ginger if you can find it. 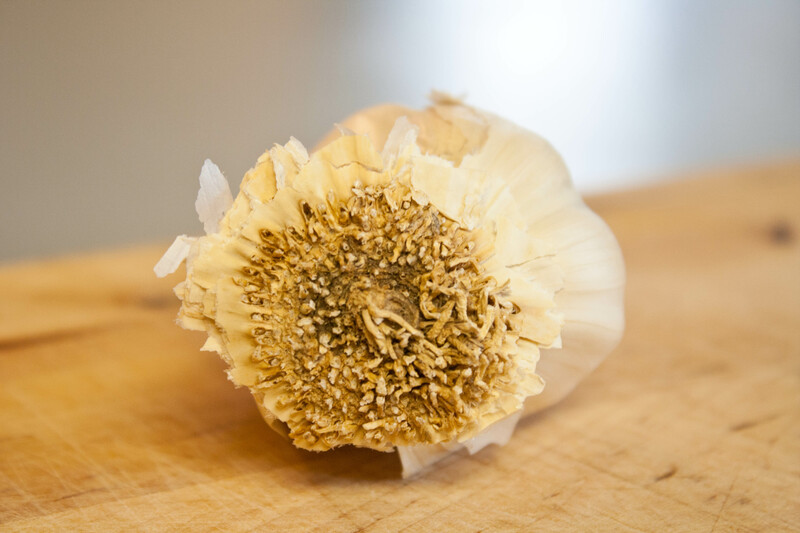 Works well in most recipes. Pinot Grigio is a really nice summer wine I think. I tend to drink more whites that are crisp and refreshing in the summertime. Great tip about the ginger! Ive never eaten the thigh! Miz recently posted..Fragmented Fila video-shoot thoughts. Chicken thighs are dark meat, so moister! I have tried this and all of the results are failures. I don’t want to do it again because it is time consuming and I’m afraid it will be a great waste again. I am not good in the broiling part that made me raised a white flag. Broiling is not my friend either! I rarely do it.